We were very fortunate to have missed the brunt of the hurricane, but others were not as lucky. As we have done in other state emergencies, we are encouraging students to band together and find ways to help those in need to our west and east. I have been through a house flood and they are devastating, no matter how much insurance one has. We are all New Yorkers and let's take some time to organize and show that we are here to help. Our community is very powerful when it bands together and now is a great time for us to shine again and help those in need. Be on the lookout for student driven initiatives. Power was out at the high school and bus garage yesterday for approximately 45 minutes due to a transformer issue on Milton Avenue. I appreciate the high school faculty, staff, and students, as well as our transportation personnel who were able to dismiss students quickly without radios, phones, or public address systems. Not a long post, but wanted to make sure all of you have the most updated information about what is happening in the District. Marching Band Win 32nd State Title - Dedication, precision, repetition, and heart have paid dividends again. The West Genesee Marching Band rocked the Carrier Dome like a hurricane (yes, my musical tastes are still living in the 1980's)! 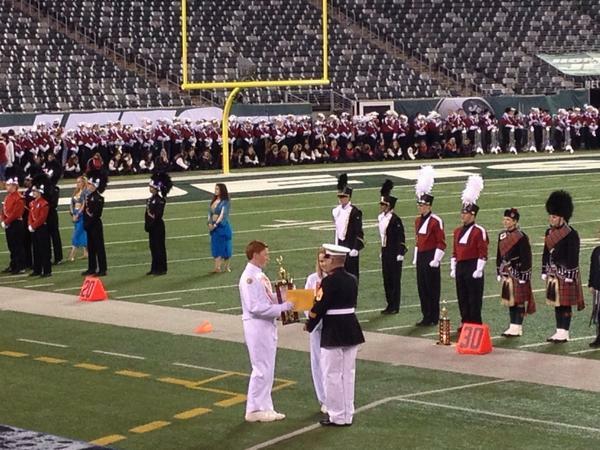 I was so pleased to watch the students perform at the highest level, yet again, to bring home the New York State Field Band Championship for the 32nd time with a score of 97.6 (a full 2.6 points ahead of Norwalk in 2nd place). I am just so happy for the students, the Marching Band staff, and the many dedicated parents who get an opportunity to see all of their hard work pay off. Planning for next year begins today. Congratulations! Hurricane Sandy - Speaking of hurricanes, I must admit that it was pretty weird to finalize our school closing contact information sheets last week. This is usually a task that is completed well into November, but the threat of Hurricane Sandy shortened our timeline. I have been a superintendent when the threat of very bad weather has actually happened, and when it has passed by. In fact, I still have the six inch stick that landed on my deck as a result of Hurricane Irene some years back. The bottom line is that with all of the communication tools that are available, we are going to get a lot of information about each and every potential weather event. It is probably wise to plan for the worst and hope for the best, and I hope that there are no additional causalities as a result of this storm. I would say that if I owned a grocery store I would have purchased about every advertising spot before and after every weather report on every local station! Redistricting Transition Planning - This week we will finalize our transition planning for redistricting. I must say that the transition team is doing a very thoughtful job of planning activities that will help to relieve some of the anxiety related to redistricting. I will give a full recap of what is planned as well as some general timelines next week. For now, everything that the committee has been working on can be located on the website by clicking here. This week our teachers and administrators will complete the creation of their goals, fall sports will officially come to a close, and we will begin to transition into concert, middle school musical, and winter sports season. Have a great week. Time Spent in the Community: The highlight of last week was getting a chance to visit the Camillus Senior Center and speak with our senior citizens. I was very happy with the format. They wanted me to come in and talk. Nothing to sell, no offices to run for, and no pressure. We had a wonderful time talking about Camillus and the way things used to be. One gentleman told me that he has lived in Camillus for 70 years and walked from Munro Road to the Camillus Senior Center (it was formerly his school) each day. He said a classmate would drive the school bus and then attend class (don't get any ideas, twelfth graders). I am looking forward to visiting the senior center again. I spent Sunday morning with about 1,400 others running the Empire Half Marathon along Onondaga Lake. I won't bore you with all of the details, but now that I have participated in a few races in the Syracuse area I must say a big thank you to all of the volunteers who hand out water along the various courses. There are "big name" volunteer organizations, faith based organizations, and sometimes people who just want to help. This is another great example of how our community works; people pitching in to make things happen. Thanks again! Redistricting Transition Team: Many community members are pitching in right now at West Genesee on our redistricting transition team, and if you have not had a chance to check out their work and are interested you can find everything on our website by clicking here. We meet again tonight and are feverishly working to plan some very beneficial activities for our students and parents who are affected by the redistricting. We hope to have these plans complete by October 29, at which time I will share them with everyone so that we as a community are all on the same page. In the Classrooms: I am very pleased at what I am seeing in our classrooms. Teachers and administrators have had a TON of new things to work through from the state and federal government, but you would not see the stress caused by all of that if you were to pop your head into a classroom. Teachers are working at full capacity to provide quality instruction, true professionals. We are more fortunate than you might think considering we are still one of only a couple hundred schools in New York State (out of nearly 700 total schools) to have our Annual Professional Performance Review plan completed. Our teachers are nearly done completing their goals (a significant time commitment) while many schools have not even had their plans approved. That will make for a much smoother late fall and winter for our teachers, which is a good thing. Schooltool Parent Portal: We also began the process of opening up our student management system, Schooltool, to parents. The program generates an email to any parent/guardian with an email address on file. To login, you must use your user name and password to access the system. If you have not received this e-mail and are interested in using the new online system to access student information, please check our website by clicking here for some helpful pointers as well as some key people to reach out to for assistance. Fall Extra-Curricular Seasons Come to a Close: Our student players and performers are nearing the end of the fall season and they are really doing well. So well in fact, that this week and next weekend are going to be very busy for all of them. Please check our website for the most updated schedules from the Athletics and Fine Arts pages. Right now I know that our West Genesee Wildcat football team plays Christian Brothers Academy in the second round of post season play, and our Marching Band performs at the Carrier Dome on Sunday in their quest to bring home another state title. There are many, many other exciting events as well so again please make sure to check our website. Also, congratulations to high school seniors Shawn Davern and Nicholas Piato, who have been selected as members of the 2013 U.S. Army All-American Marching Band. They will join an elite group of musicians who will perform during halftime of the U.S. Army All-American Bowl at the Alamodome in San Antonio, Texas. This is also the time of the year when I get to speak to seniors in their Participation in Government classes. It is a great opportunity to connect with them as they begin to make some life choices as graduation gets closer and closer. Wildcat Marching Band: When I got the word from New York City that our Marching Band had taken second place overall in their competition, that included over 60 Marching Bands from five states, the first word that came to my mind was "representing". As always, the band has represented our community very well and at an exceptional level. With over 160 students in the band, it is loud, clear, organized, tight, and a pleasure to watch. 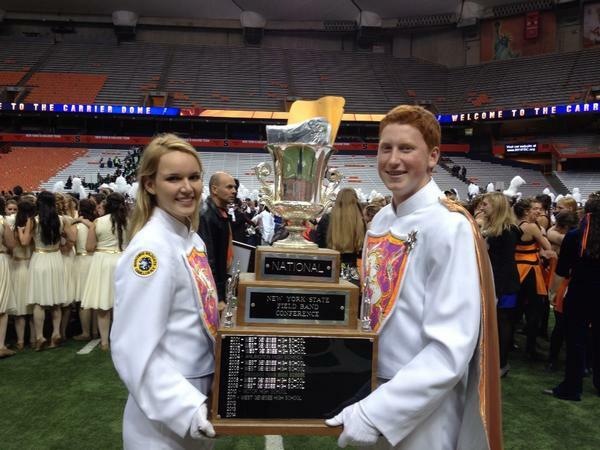 You can see them at the NYS Field Band Championships at the Carrier Dome on Sunday, October 28, 2012. Information about the event can be found on our website. Landmark Theater: If you are from Syracuse you know how much history the Landmark Theater contains. It was great to be back in the Landmark to see Jersey Boys over the weekend. I have probably been to over a dozen shows and concerts in the Landmark since the 1980's, and I had just as much fun soaking in the nostalgia as I did watching the show. My wheels are turning to find some way to get our students performing on that stage in the future. Parent Portal: As promised, we are beginning to roll out parent and student access to our student management system, Schooltool. Parents will be receiving their welcome and access e-mail messages shortly. This is an exciting part of this powerful program that is a great benefit to both students and parents. Redistricting Transition Meeting: After what I am sure will be a delicious spaghetti dinner sponsored by the Sports Boosters tonight night, the first redistricting transition team meeting will be held. There will be 26 of us gathering to plan activities for both students and parents who will be redistricted. Meeting minutes will be placed on our school website and can be viewed by clicking here. I will also update all of you with the master plans via my blog as well. Full-Day Kindergarten Transition: The transition process to full-day kindergarten has also begun. You might ask yourself how difficult that could be. It won't be if we get a jump on it now as we prepare for the next school year. Full-day kindergarten will not simply be double what we have been doing during our half-day program. It will mean different curriculum, more special area experiences, and more opportunities for socialization. All of these things will help our youngest students be that much more prepared for first grade. Upcoming Fall Sports Playoffs: Keep an eye on our SNN emails and our website for fall sports playoff and sectional schedules. Details will be emerging as early as later today, and the students always appreciate the extra support that you give. Five Weeks Down: It is hard to believe that five weeks are almost in the books already! Five week reports will be home shortly to help give you a good first look at how the school year is starting off for your children. If I was grading the school year, I would be sending a pretty positive five week report. There have been an unusually high number of new initiatives to tackle and things are going as well as they can. We also had a very positive homecoming weekend, and our students just seem happy to be at school. Anti-Bullying Effort: Next week will be the kick off for the curricular part of our anti-bullying efforts. Most of the buildings will be using Tuesday (a half-day for students) to introduce OLWEUS to students. This programming will become a large part of how we continue to address bullying. This program will also help us to work on the role of the bystander in bullying situations so that better choices can be made when situations involving bullying arise. Thanks to all of our parent and staff volunteers for being a part of this launch and program. If the school year was an airplane flight this is the point in the flight where we are just about at altitude and ready to cruise along to our destination. You can remove your seat belts and feel free to move about the cabin. Have a great week. Before I take you through the week and all of the great things that were accomplished, we must all pause to reflect on the loss of a recent graduate, Joshua Smith. Josh was a member of the Navy and was stationed in Ballston Spa. He was the passenger in a vehicle that crashed and took Josh's life and the life of the driver of the vehicle. Probably the most comprehensive story about his life and death can be found here: http://www.syracuse.com/news/index.ssf/2012/09/fatal_crash_ends_west_genesee.html. I am hopeful that Governor Cuomo will order flags at half staff due to this tragic loss. Another life taken too soon. Open Houses a Success: In much happier news, all of our open houses are complete and I would like to thank you as parents for attending, as well as our faculty and staff for their preparation. Our attendance was through the roof and parents had great opportunities to see teachers, administrators, and support staff in action. Thanks again. Tournament of Bands: The end of open houses also signifies that it is time for the Tournament of Bands. Thousands were on hand, including ten Marching Bands from all over New York State. Thanks to our volunteer parents and community members for keeping things free flowing and organized, Mr. Davern and Mr. Stachnik for overseeing the whole event, and our buildings and grounds crew for helping our campus to collect a truck full of compliments. the anti-bullying program and new student management system up and running as well. Spirit Week at the High School: This week is spirit week in the high school as we ramp up to our homecoming on the weekend. It is always a fun time of the year as we see our students come together and show off school pride! Have a great week and I will write again on the flip side.